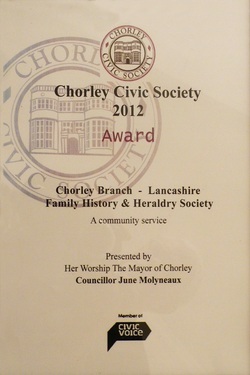 Chorley Branch of the Lancashire Family History and Heraldry Society has been awarded the Chorley Civic Society 2012 Award in recognition of our service, through family history, to the local community. Our branch volunteers do not expect to get public thanks for the many hours of work they do, their satisfaction comes from helping others. However the award will provide a boost for them, knowing now that their efforts have been publicly recognized. We will continue to provide our services to or members and the public, thankful to have received this public “thank you”. The LFHHS Chorley Research Centre at the Astley Hall Farmhouse provides help and facilities for members of the public to research their family history. It is manned by volunteers from the branch and is open to the public on 4 days per week. We have internet access, we have microfiche, we have books – all containing records both, local and further afield, which will help researchers in tracking down their ancestors. Our biggest asset is our volunteers who are all Family Historians, who give freely of their time and knowledge to help the visitors to our centre. Chorley Branch’s Education Team run 3 Family History Courses, one aimed at Beginners and 2 at Intermediate level, for the benefit of our members and the public. This team give up 20 Fridays in the year to run two courses per year – one in spring, one in autumn at Charnock Richard Scout and Guide Headquarters. Family History is taught by Family Historians in a friendly and supportive environment. Our Projects are a large part of our work in the community – our project teams transcribe archive material to make it more readily accessible to the public, and in doing so help to preserve the original documents. We have a long history of transcribing Parish Registers, many churches in the area have had their registers transcribed – most recently completed are St Georges Chorley. Our teams have also just completed a mammoth task, the transcription of the Chorley and Adlington Cemetery Records – again preserving the original burial books and making the data contained in them more readily available – and searchable! We have a team working alongside the Chorley Remembers group, researching the war dead of Chorley, from the Boer War to present day conflicts by extracting names from the Chorley Guardian. As a continuation of this work, our team is extracting all articles in the Chorley Guardian which reference any mention of a service man or woman and using this information to build a military database and index which will be available to the public to research their ancestors’ military history. In August, the Branch organises an annual Celebration of Family History at Astley Hall. We bring together experts and agencies from far and wide to make themselves available to the public of Chorley to answer their Family History Questions and queries. And in fact not just the good folk of Chorley, our visitors to the Celebration come from near and wide – Yorkshire, Shropshire, Merseyside spring to mind from our last event. Over the years, the Celebration has become a not to be missed event in the Family History world! Lastly, our monthly meetings at Chorley Library give our members the opportunity to get together, talk about their hobby, get advice and help if they are stuck and to listen to a speaker talking on a Family History related topic. This award to Chorley Branch is an award to all our members and volunteers, who give of their time freely, and through Family History, to serve their community – as Chairman, I am very proud of them all – they all play a part.